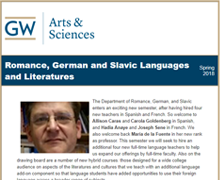 The GW Department of Romance, German & Slavic Languages & Literatures fosters critical thinking, reading, speaking, and writing within and across cultures and histories. Beyond our degree and minor programs, the department offers dozens of language, culture, and literature courses in French, German, Italian, Portuguese, Russian, and Spanish to hundreds of students every semester. Most of courses are taught in the original language; some are in English. Students who take courses in our department benefit from a variety of research and scholarly activities. It is our belief that the more active a professor is in his or her scholarly field, the more this knowledge will be incorporated into the classroom for students to gain from the professor's expertise. In the coming years, the department is committed to expanding the research and scholarship activities of its faculty, while continuing to offer the highest possible level of instruction in Romance, German and Slavic languages and literatures. Antonio López is Associate Professor of English and Interim Chair of the Romance, German, and Slavic Languages and Literatures Department. His teaching and research focus on U.S. Latinx literature and culture from the colonial era to the contemporary period.